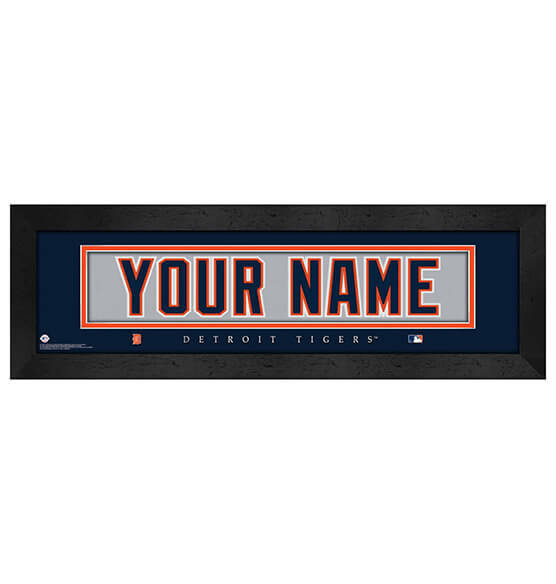 Boldly show your love for the Detroit Tigers with this high-quality, officially licensed Personalized Nameplate Framed Wall Art Piece. Whether you purchase one for yourself or you give one as a gift, this custom nameplate may just be an MLB fan's dream gift. Featuring brilliant team colors, premium glass and an elegant black frame, this custom gift looks great anywhere. It comes ready to hang with an included sawtooth hanger for easy decorating. Knock your gift-giving skills out of the park with the help of our custom baseball gifts. Whether you're shopping for holidays, birthdays, anniversaries or more, you're in good hands with PersonalizedThings by Exposures.